The pleasant snow cover that has come at last made life easier for the caterpillars of the drinker moth (Euthrix potatoria). The behaviour of these wintering caterpillars is highly interesting. In autumn they stay somewhere on the ground between fallen leaves and withering grass straws, waiting. What they wait for is snow and suitably mild winter weather, with a couple of degrees above or below zero. A few centimetres of snow cover still doesn’t set them moving. But if the snow depth starts to exceed about ten centimetres we can see an interesting sight: blue-black-white-yellow patterned caterpillars lazily crawl up on to the white snow. 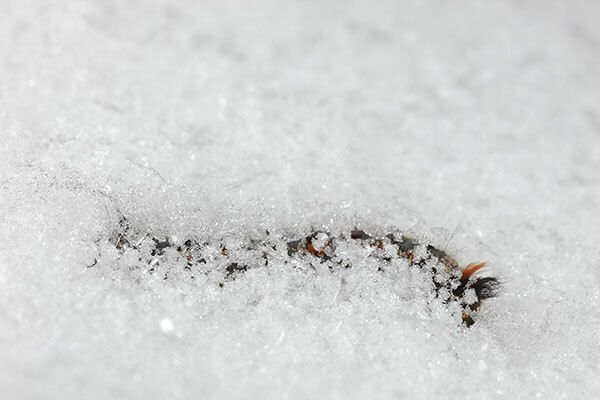 The slightly hairy caterpillars are about 3-4 centimetres long and easy to find on the snow. Even more interesting – the caterpillars stay on the snow and will not return to the ground under the snow. When it gets colder they “freeze“ in place and with new snowfalls get buried under a new layer of snow. Their wintering now continues in the snow. When it is still fluffy enough they climb up to the surface during the next thaw and stay there, waiting for a new snowfall. But when the snow becomes more compact towards spring the warm springtime sun helps them out from the snow. It is believed that this behaviour is useful for getting rid of fungi spores and other potential pests that are present on the wet ground. While they crawl on the snow the radiation from the sun acts as a sterilizing ultraviolet lamp. In fresh snow potential infesters are probably absent. Last weekend the weather in the Kärkna forests in Tartumaa was perfect for insect watching. 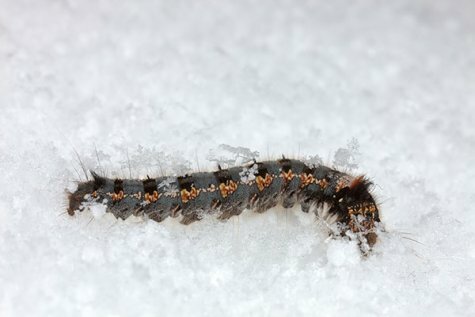 There were 1-2 degrees of cold and many drinker caterpillars were on the snow. On forest road a couple of hundred meters long I counted 7 of them at the roadside. Then the weather started to go slowly colder. Although the car thermometer showed 3 degrees of cold today the weather felt much more chilly. But most of the caterpillars today were just where they had been on Sunday, they were only silently getting buried in snow. Until a new thaw.